We advise you to use Bloodlust/Heroism/Time Warp as the encounter commences. On Mythic difficulty, it can alternately be used after the second Eradication to close out the fight as quickly as possible. The Decimator is a weapon available to the Garothi Worldbreaker that will occasionally cast Decimation, which inflicts moderate Fire damage to anyone within 12 yards of the impact zones and light Fire damage raid wide, regardless of position. The Decimator can be destroyed by the raid, and doing so will remove the Decimation ability from the encounter. The Annihilator is a weapon available to the Garothi Worldbreaker that will occasionally cast Annihilation, calling missiles down from the skies that deal moderate Fire damage within 4 yards, split between the targets hit. Missiles that are not absorbed by players will deal moderate Fire damage raid wide. Anyone hit by the missiles also takes damage every second for 10 seconds. The Annihilator can be destroyed by the raid, and doing so will remove the Annihilator ability from the encounter. Fel Bombardment attacks the current target, locking on for several seconds before being unleashed. Upon expiration of the debuff, the target is bombarded by missiles at the target's destination every second for 5 seconds, dealing moderate Fire damage to anyone within 7 yards of the impact and knocking them back. Apocalypse Drive occurs exclusively at 65% and 25% health; the Garothi Worldbreaker begins a cast that inflicts moderate Fire damage every 2.5 seconds. If one of the Garothi Worldbreaker's weapons is destroyed before the conclusion of the cast, the cast will be interrupted. However, if the cast completes, the raid will take massive (and likely lethal) Fire damage. Surging Fel only appears on Heroic difficulty and above, and occurs concurrently with Apocalypse Drive. As Apocalypse Drive powers up, Fel energy will erupt across the battlefield and deal moderate Fire damage to anyone hit. Eradication occurs periodically; the Garothi Worldbreaker will smash the ground and deal massive Physical damage in a cone to players within 60 yards. Anyone hit is also knocked back, however, the damage is reduced based on distance from the Garothi Worldbreaker. Eradication is always cast after a weapon has been destroyed, and concludes the Apocalypse Drive mini phase. After the conclusion of each Apocalypse Drive, the Garothi Worldbreaker is Empowered, increasing damage done by 20% (per stack). Searing Barrage occurs periodically following the first cast of Apocalypse Drive, dealing light Fire damage to random targets every 2 seconds. Carnage will only occur if no players are in melee the range. The Garothi Worldbreaker will continuously smash the ground, dealing moderate Fire damage raid wide every second, for 10 seconds. The Garothi Worldbreaker is a stationary boss, locked in place to his starting position. Melee range by at least 1 player must be maintained whenever the boss is not casting mechanics to avoid casts of Carnage. The melee are free to stand where they choose, though it is generally best to have the tanks occupy one side of the boss while the melee camp groups up on the opposite side. Ranged DPS and Healers should form a loose spread around the middle of the room, allowing them to easily spread to soak casts of Annihilation. It is important to reform that loose grouping after each soak, however, to give players targeted with Decimation space to spread out. Ideally, Decimation targets should spread to the edges of the room, allowing them to maintain range on their targets but leaving the center of the room clear for the rest of the group to perform their roles safely. Tanks should perform a taunt swap following the application of Fel Bombardment. The debuffed Tank should make their way to the edge of the room and ensure all the incoming missiles are avoided. Mobility cooldowns may be necessary, and less mobile Tanks (such as Death Knights) may want to stay clear of the very edge to avoid being accidentally knocked off the platform if they make a mistake. Tanks should always go to the same side of the room with Fel Bombardment for consistency, and this area must be designated off limits for the placement of other mechanics. Namely, any melee targeted with Decimation should stay clear of the Tanks' Bombardment zone. At 65% and 25% the Garothi Worldbreaker will enter a pseudo-intermission phase, beginning Apocalypse Drive. The Garothi Worldbreaker will become untargetable, and its 2 weapons, the Annihilator and the Decimator, will appear. Destroying one of the weapons will interrupt the cast of Apocalypse Drive and prevent a raid wipe and remove a mechanic from the encounter. For the first Apocalypse Drive, it is recommended you destroy the Annihilator, removing the Annihilationmechanic entirely, which is the most disruptive. On Heroic difficulty and above, the raid will also have to avoid Surging Fel, which can simply be dodged on either side. During the second Apocalypse Drive, only the Decimator will remain and it will then be destroyed. If the raid successfully destroys a weapon system before the conclusion of Apocalypse Drive, the boss will return and recommence its assault on the group. Be aware, however, that this will begin with a single cast of Eradication each time Apocalypse Drive ends. The entire raid should escape to the back of the room. Demonic Gateway, in particular, is very useful for achieving this easily. Healing cooldowns may be necessary, however, as long as everyone is at maximum range there should be no issues with survivability. Additionally, damage will be increased by 20% each time a weapon is destroyed via Empowered, resulting in a 40% damage increase by the time the fight concludes. The major tank concern on this encounter is Fel Bombardment. The debuffed tank must always be careful to ensure they are not knocked off the platform when dealing with this debuff, avoiding as many missiles as possible each time. 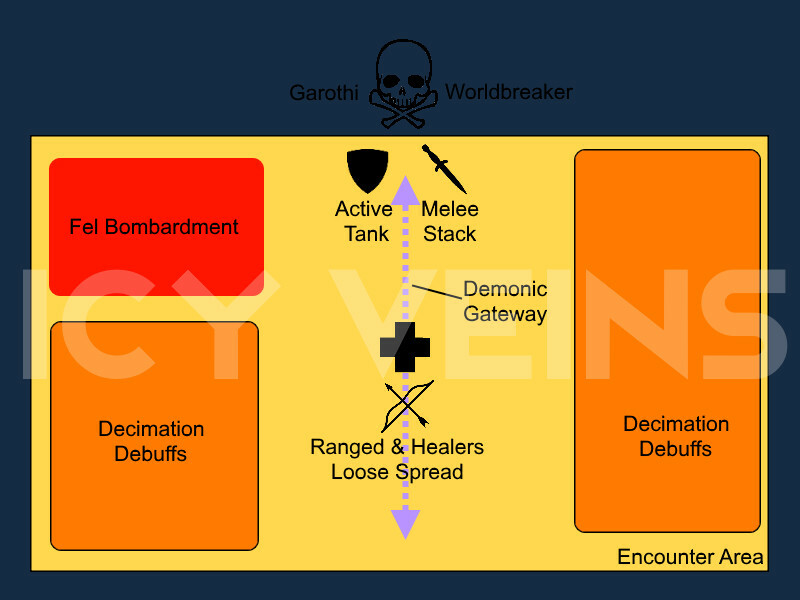 The melee and ranged must also keep the designated area free of Decimation debuffs, as the extra damage could be lethal or force the use of unnecessary cooldowns. Tanks can also assist with Annihilation soaking when possible, as there are generally several spawns within melee range. There are not many points of significant threat to the raid throughout this encounter. Eradication is the main ability that will cause a large spike in group health, however, there is little follow up damage meaning deaths are unlikely unless they are killed in a single hit. Later Eradication casts in particular should be managed with raid cooldowns, due to the buff from Empowered. getting at least 40 yards from the boss during Eradication. Overall, this boss is very straightforward and should pose little trouble to most groups. We advise you to use Bloodlust/Heroism/Time Warp as the fight begins. The group should have no trouble destroying a weapon without the use of Bloodlust, and despite the damage buff from Empowered, the removal of mechanics makes the fight progressively simpler with each Apocalypse Drive. On Mythic difficulty, the Garothi Worldbreaker's weapons will be empowered after they are destroyed, rather than having their mechanics removed from the encounter. Haywire affects each weapon differently: Haywire(Decimator) and Haywire (Annihilator). When the Annihilator is destroyed, it will empower Annihilation to strike twice. The first set of Annihilationzones will appear and trigger as normal, however, they will also knock players a significant distance, with the directional control being based on the center of the Annihilation zone. After the first set triggers, a second set of Annihilation zones will appear in the same location (with a slightly different visual effect) and detonate several seconds later. Just like lesser difficulties, Annihilation inflicts heavy Fire damage split between all targets in the blast zone. Any zones that are not soaked, however, will inflict heavy raid wide damage instead. When the Decimator is destroyed, it will empower Decimation to stun its targets for several seconds. 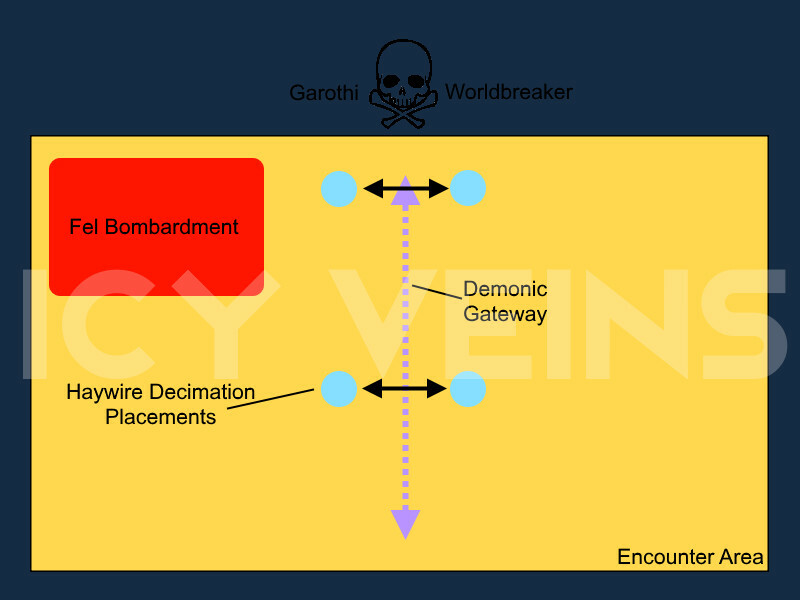 Decimation itself will still function in an identical fashion, however, due to the stun the targets will not have time to move and properly place the Decimation targeting zones. Luring Destruction occurs immediately prior to every Eradication on Mythic difficulty. The boss draws in the entire raid towards himself over 3 seconds, inflicting moderate Fire damage every second while doing so. He will immediately cast Eradication when Luring Destruction ends. It should be noted that Surging Fel does not take place during Luring Destruction. On Mythic difficulty, the fight is identical until the first cast of Apocalypse Drive, at 65% health. During this "transition" style phase the raid should destroy the Decimator first. Surging Fel will be taking place throughout this time and should always be avoided. As soon as the weapon is destroyed the Surging Fel will dissipate, and the boss will cast Luring Destruction. All raiders must immediately evacuate to the back of the room, using movement cooldowns to counteract the suction effect of Luring Destruction. Failure to escape to the back third of the room in time will likely result in instant lethal damage from the follow-up Eradication. A Demonic Gateway from the boss to the back of the room is the easiest and most efficient way of dealing with Luring Destruction. The melee and ranged will each stack on one of their markers. When Decimation is applied, all members will move immediately to their opposite marker and re-stack. The targeted players that were stunned will have a window to move before Decimation impacts. Annihilation is handled normally in this phase, although the raid must be quick to restack on their marker following soaks. The second interval of Apocalypse Drive occurs at 25% health. When the Annihilator is destroyed, all Annihilation zones must be soaked twice, sequentially. Due to the addition of a knockback to the first soak, the raid will only have a few seconds to soak the second set before they detonate and wipe the raid. When soaking the first Annihilation casts, raiders should position so that they are knocked towards other Annihilation zones that they will be able to immediately soak upon landing. This final phase, from 25% health to 0, is very hectic and personal cooldowns should be used liberally to survive. Decimation is handled the same way as described above during this final portion of the encounter. For early kills, we recommend using Bloodlust/Heroism after the second cast of Eradication. The boss will be at 25% health, and this represents the most chaotic and threatening portion of the encounter. Adding the extra cooldown here will allow you to close out the fight as cleanly and quickly as possible while bolstering healing to patch up any mistakes. Current time: 04-25-2019, 10:23 PM Powered By MyBB, © 2002-2019 MyBB Group. Created by DSlakaitis.